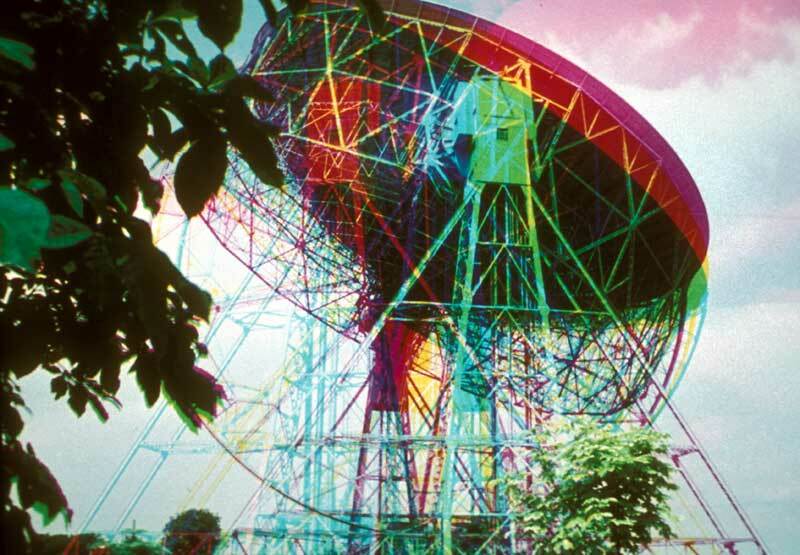 This is a shot of the space telescope at Jodrell bank in Cheshire, UK. It was taken quite a few years ago with a triple exposure on a Nikon. The first exposure was taken through a primary green filter ,then a primary blue and finally a primary red one. The camera was on a tripod of course. As you know red light + green + blue light will give you white light so if nothing moves you should get normal colours but if the subject moves then you get some interesting effects. You will have to do some tests to work out the correct exposure. But as a guide I normally give 1/3rd of the exposure to each exposure but you also have to take into consideration the different filter factors.